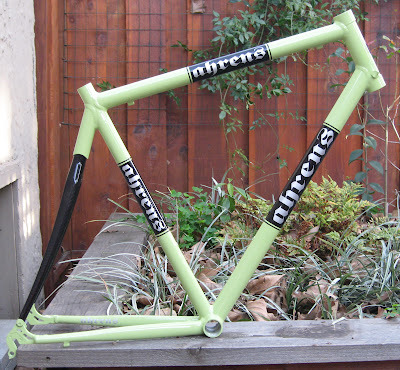 Here are some images of a new Carbonated Road Frame built for Wenzel Coaching staff member Mark Payares. With an educational background in Kinesiology and a Doctorate in Physical Therapy, Mark is definitely a unique client! Mark has extensive cycling experience at all levels including BMX, road racing, track racing, fitting and working with other skilled athletes. I feel privileged to have worked on this project for Mark and I can't wait to hear how it rides after it's fully assembled. Featuring Easton 7005 Ultralite tubing and Reynolds stiff carbon seatstays, this frame is very light, laterally stiff and well-balanced. Reynolds offers two versions of carbon seatstays and the stiff version is definitely applicable for maintaining lateral stiffness AND some vertical compliance....carbon fiber is sick! Chainstays are oversized for additional stability behind the BB shell. 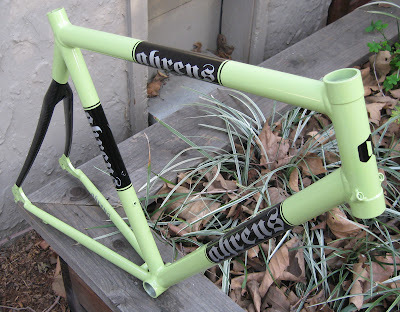 The frame is custom painted 'asparagus green' with black panels and silver decals. Mom always told me to eat my vegetables....and this frame looks very tasty indeed.